This month we welcome spring with some fresh looks from our Amazing Looks Team! Our first model, Ayden, is a very stylish and fashion-conscious guy! With a dad in the hair and beauty business, it’s no a surprise that this young man has been schooled on how to pull a great look together. His totally cool, rock-and-roll look started off with some distressed jeans from the 1969 brand that were $3.99. From there we added an on-trend graphic t-shirt by Pelle, which was also $3.99. The color and pattern really make a statement! The great thing about Goodwill and kids clothes is that since they grow so quickly, you’ll often find things like this pinstriped blazer from the Amherst Collection, that are in fantastic condition! A blazer like this one that we found for $3.99 can make any man, young or old, a little more fashion-forward when worn with more casual items like the t-shirt and jeans. Adding some of Ayden’s own accessories like the sunglasses, fedora hat, and black dress shoes took it to another level of hipster coolness. Let your kid explore the realm of style in their own way, and they’ll thank you for it! And, at our prices your wallet will too! Damara, is one bright and sunny lady! Her personality shines through no matter what she wears, so that’s why I complemented her disposition with some bright fashion choices. Mixing patterns seems like it would be tough but it really isn’t. Focus on items that complement, but don’t match necessarily. 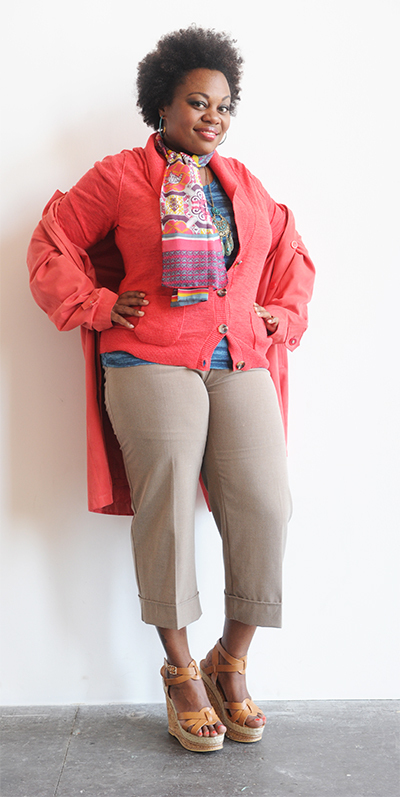 As a base we used neutral cropped pants from AB Studio for $4.99, and her own wedge-heeled shoes in tan. These wide-leg capris are all the rage again in fashion so keep your eye out for some when you’re shopping! The top is a green/blue print from Exertec for $3.99 and it served as a great foil for the orange Mossimo cardigan ($4.99) and the Ensign coral blazer ($6.99). Since both tones are similar, they work well together or separately! Remember, that cool tones work well with warmer tones and the colors just really pop here when we put it all in the style blender! A patterned scarf, as well as a cool dangly necklace ($3.99), were all she needed to make this look into a memorable fashion statement. Bright always makes right when you sparkle like Damara does in another Amazing Look brought to you by our team!